As the Welsh Government’s consultation on the next Wales & Borders rail franchise draws to a close (ends 23rd May 2017), so to must my series of posts regarding issues that I hope the new franchise will address. In this instalment, I discuss some of the problems with station facilities and bus-rail integration, using examples from Fishguard. The consultation on improving bus services in Wales, due to end on 31st May, might also be relevant to this discussion. The first draft for this post was started several years ago, but never finished. It started by stating a sad fact; that very few use the existing bus ‘connections’ into and out of the Fishguard train services. I have not used these services for quite some time, so am not sure whether the loadings have improved but given the very poor offering I doubt this has changed much. The Fishguard trains themselves (well, most of them) appear to have been well used; certainly it was enough that the trial service of additional trains was extended until the end of the franchise. 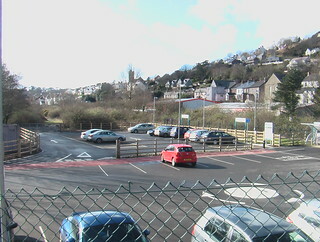 Most users of the rail service seem to travel to and from the new Fishguard & Goodwick station by car or taxi, a point illustrated by the fact the car park has been extended. For Goodwick residents who live within walking distance, and those who drive to the station, Fishguard & Goodwick is a very useful facility in a much-more convenient location than Fishguard Harbour. Passenger numbers at the latter have fallen to their lowest level since 2004 as local traffic has switched to using Fishguard & Goodwick. While the reasonably strong usage of the rail service is welcome, wouldn’t it be even better if more passengers left their cars at home and arrived at the station by bus? The low use of bus ‘connections’ can be seen in two different ways. One view is “nobody is using the buses, so we shouldn’t spend any more money on them”. I see it differently; people should be asking themselves “why are so few using the bus ‘connections’?” so that improvements can be made to get more people using the buses. Or, to put it another way, what aspects of the current offering might put off potential passengers? Broken link: a 410 service is seen here outside Fishguard Town Hall, where many of the buses serving Fishguard’s two stations terminate, often without good onward connections. The first problem is one of journey opportunity frequency. While buses run between Cardigan and Fishguard most hours during the day, and there are 7 trains per 24 hours in and out of Goodwick, the number of through journeys using bus and rail is much lower than 7. The weekday train services departing Fishguard’s stations see only three semi-reasonable bus ‘connections’ from Fishguard town centre, one of which runs through from Cardigan. It is also possible for passengers from Cardigan to join the 13:29 ‘boat train’ from Fishguard Harbour, following a 42-minute wait at the station. There are also buses from Fishguard to Goodwick arriving at 18:40 and 20:33, but these would involve a rather long wait for the trains which depart Goodwick station at 19:11 and 20:53. At most, that is 2 buses from Cardigan/Newport and 5 from Fishguard, but I don’t consider the longer waits to be ‘connections’ as that sort of thing will put people off. Even then, two of the better ‘connections’ involve waits of 11 or 12 minutes at Fishguard & Goodwick, which is probably enough time to get uncomfortably cold on a windy winter’s day. Nothing north of here: the Richards Bros’ depot in Newport after arrival of the last bus of the day from Goodwick, which connects out of a train there. 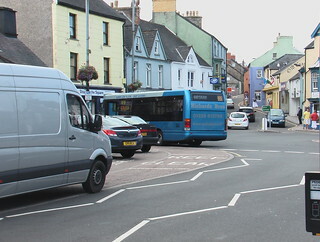 In the other direction, there are four semi-reasonable bus ‘connections’ to Fishguard (three from Goodwick station and one from the harbour), one of which continues to Cardigan and one to Newport. Two further buses to Fishguard town centre provide very tight (less than five minutes) ‘connections’ out of trains at Fishguard & Goodwick, one of which continues to Newport for a total of 5 buses to Fishguard, 1 to Cardigan and 3 to Newport. Unfortunately the only bus to Cardigan leaves Goodwick at 07:44, meaning passengers taking the bus from places north of Newport to the station in the morning cannot return the same day. To make matters even worse, the train connecting into that 07:44 originates at Clarbeston Road, with no connection from further east. That train is effectively an Empty Coaching Stock (ECS) move, so there is no bus link through to Cardigan from any of the useful Fishguard trains. 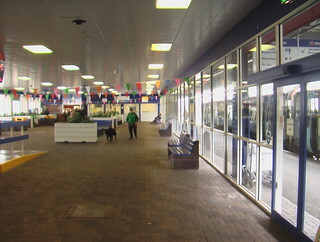 The waiting room area inside Fishguard Harbour station. 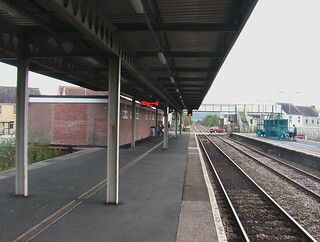 A class 158 can be seen at the platform outside. The bus from Fishguard Harbour to Fishguard town centre mentioned above involves a 23 minute wait. That stretches journey times, but I have counted it above because the wait is at Fishguard Harbour, which has toilets and a fully-enclosed waiting room which provides shelter from the wind. Waits of that duration at Fishguard & Goodwick and Fishguard town centre were not counted, because of the lack of shelter from the wind at either of these places (although if Fishguard library in the town hall is open it makes a good waiting room). 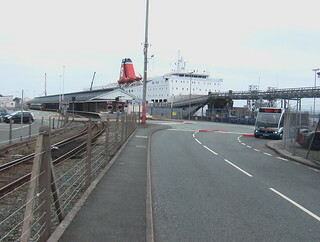 Following the tragic demolition of the original station building at Fishguard & Goodwick, the only negative aspect of reopening the Goodwick station was that several buses which had served Fishguard Harbour since the trial rail service started were re-routed to Fishguard & Goodwick, with the harbour reduced to ferry-connecting buses only. This means that, for most services, passengers do not have the choice of changing at Fishguard Harbour where the facilities for interchange are far superior. The trains are normally punctual, but in the mercifully very rare event that things go wrong on the railways delays can be significant. This means that the 5-10 minutes waits that are acceptable at a station with no indoor waiting area (such as Fishguard & Goodwick) perhaps do allow for a robust connection. 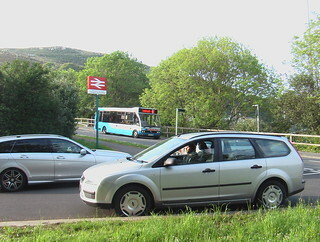 For a connection from train to bus, 15-20 minutes is probably the sweat spot, but such lengthy waits in a draughty bus shelter are unlikely to be considered an attractive alternative to motoring. Windy Whitland: the draughtiest station of all? The same applies to connections between trains, unless the connecting train is guaranteed to be held if the incoming service is late. In terms of the Fishguard service, Clarbeston Road and, in particular, Whitland are cases-in-point. At Clarbeston Road, passengers on the 06:50 departure from Fishguard Harbour have 14 minutes to wait according to the timetable. Passengers interchanging between the Fishguard and Milford Haven branches are less likely, since an hourly bus service exists between Fishguard and Haverfordwest, the key centre on the Milford Haven branch, with buses every half hour from there to Milford Haven. Whitland is the big problem; fancy a trip to Tenby by rail from Goodwick or Haverfordwest? In most cases that will be a wait of at least 20 minutes in both directions at Whitland, one of the windiest stations I’ve ever spent a significant amount of time at. Sometimes, the wait is nearer 40 minutes. As the junction for the Pembroke Dock branch, this station is a disgrace with very little in the way of facilities. If you’re lucky and the wind isn’t blowing then there is shelter from the rain; and that’s it. In the evening, the Clarbeston Road connections are timed at only 5 minutes and I believe the services are held in the event of a delay. That’s a sensible way of dealing with a rural station where occasional interchanges are made that don’t involve buses. It is however very unlikely you will be able to get a rail ticket that includes your bus journey to somewhere like Newport (the little Newport in Pembrokeshire that is, not the big one in S.E. Wales), and they often cannot wait for late trains (and vice versa). That means the rail industry commitment to get you to the destination stated on your ticket won’t help you if you miss the last bus of the day (which one of the Goodwick to Newport links noted above is). For a decent interchange between rail and bus therefore, a waiting room is required, ideally toilets too. I am well aware that a staffed station is too much to ask for at somewhere like Fishguard & Goodwick, and that even an ‘un-staffed’ station with the required facilities would be more expensive than the one we have now. In Fishguard’s case though there is a much-more-practical suggestion; sending the buses to Fishguard Harbour (something I intend to discuss in more depth in future, perhaps January 2018). No waiting on Sundays? Romsey station waiting room on a Sunday, the door is locked. There is no easy way out at Whitland though, the only solution is a waiting room, probably with the station remaining un-staffed. Vandalism is therefore a concern, but surely the human race has the technology to resolve that issue, in the form of CCTV. 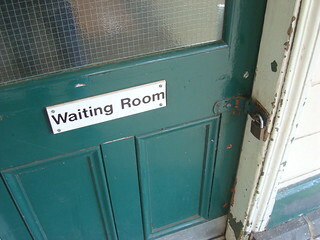 Even if the station were staffed, the waiting room would have to remain open outside reasonable staffing hours, since trains would be running and passengers potentially interchanging. Arriving into Aberystwyth at around 19:20 with 25 minutes to wait for a bus is only marginally better than having 25 minutes to wait at Whitland, and only because Aberystwyth station is in a more-sheltered spot. This is despite the fact that Aberystwyth station has both a waiting room and toilets; the problem is that both are locked when the staff leave at around 17:30. Sundays might be even worse.